If you have what you think or know to be a genuine players challenge car, please post your info here. I am collecting as much information about the series and the cars as I can. I'll be adding it to my web page as I collect info for all to enjoy. Hot items: How many players cars were produced each year? Last edited by Mark_ZZ3; 12-11-2009 at 12:28 AM. I remember driving one of these cars back in 1991 after graduating college. I worked at a independent used car dealer in Toronto Ontario (at Allen Road and Sheppard). A wholesaler brought one in that he picked up to sell to us. It was repainted red, with a tan interior sloppily put in, and had a Audiovox stereo stuffed in the dash. That balanced and blueprinted 305 TPI and 5 speed was faster and more fun to drive than the Corvette's on the lot. 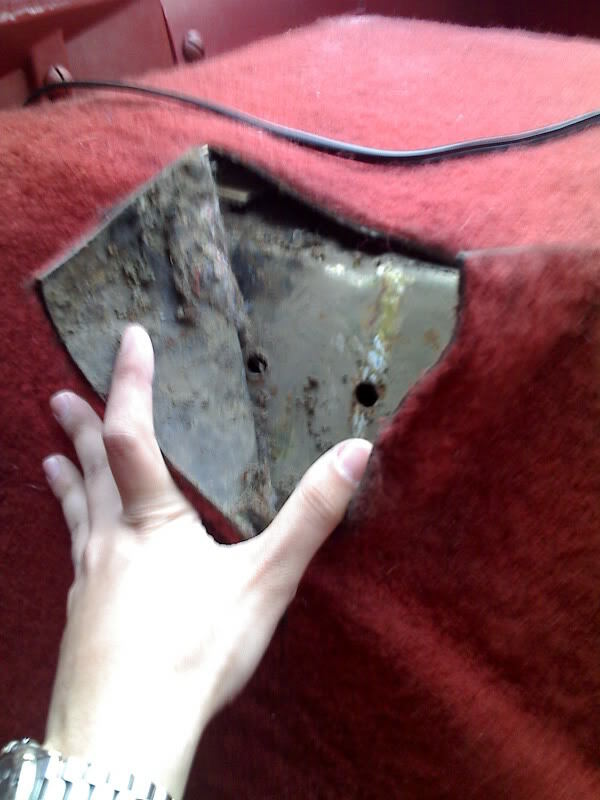 I remember the stubs or the roll cage evidence of the cage being chopped out. I think it was a Don Howsen dealership car.I really wanted to buy that car, but couldn't afford it. It was $3000. I couldn't afford it because i had just a week before bought a 69 cutlass Convertible. That car really sucked. that is some awesome info mark, it was neat to look up some of the pics i have on my computer and see who was driving the cars. like this one, looks like Howie Scannel lost in it in the turn and Peter Cohen nearly misses him. I believe I have an 88 1LE? How can I tell for sure is there something special in the vin? Marks got great info on this stuff, theres also a complete board on my forum for players junk, check it out @ vancouverfbody.com we've all learned a lot from each other! Re: I believe I have an 88 1LE? If you PM me your VIN, I can tell you if it falls in the range of a Player's car. The other way is to check your RPO's ... look for A4U for a 1988 car. Mark, do you know of any 1991 to 1992 R7U cars for sale? One day I would to get one to go with my B4C's. I come across a few once and a while. Nothing jumps out right now. 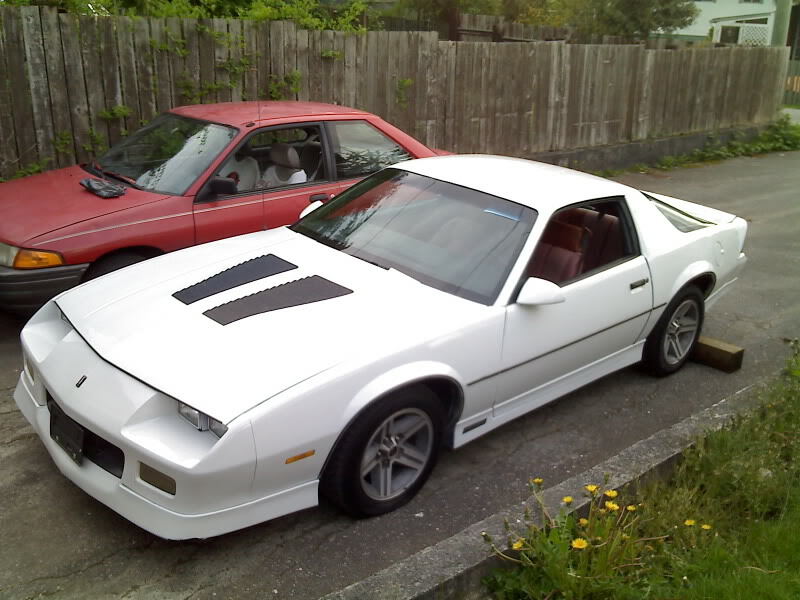 Camaro or Trans Am? Race trim or street trim? Racing history or unraced? Either or really but would probably prefer Camaro. Race trim or street, dont really care. Hell, a slighty damaged one too maybe. Just really like the history of these cars and how popular they were up North vs down here. Actually, there is a 1991 R7U on ebay right now. Do you know anything about that one? Search under 1LE. Check out my posting ... one is on ebay. I know that Camaro 1LE that's currently on ebay. My friend was the second owner when he had purchased it in 1996 and sold it in 1998, which he regrets now. The original motor had been modified with cam and other things, it had no cat's, and it ran very rich. He had tinted the windows as well. The car had low km's on it when my friend aquired it. I am not sure about the km's that is advertised now on ebay. I was very suprised that this car is still around the toronto area. Well, I thought that I would share this with you. Was your friends R7U a white one? I just found this thread while looking for something else. I bought a white R7U recently. Yes, my friend's was a white R7U car. Did you purchase yours on e-bay? Nice meeting you at the OCC Nationals. Do you go to any cruises? I had my Players car running today MUAHH!!!! I love it i love it. Howdy. Glad to hear you car is out. Mine are both sitting. Fired them up in February during our warm winter. Need to start wrenching on one of them ... full restoration. Got new 1LE brakes in a box (from GM show car). And a few other goodies. Yeah. My dad has one (NomadTA). I love that car and everything about it. Its never been raced though, never had a cage in it either. As far as we know GM used it for some promotional deal, then a dealer bought 5 of them. Dont know all the owners of the car, but it started with the 305(as all the 91 R7U's) and now it has a 350. Does anyone know if all the 91 R7U cars were white? I think I've spoke with your Dad. The car came out of Winnipeg if memory serves me. As to colors of cars. That was about the only choice when picking R7U. Many cars were white as they were the easiest to paint. In the early days, there was quite a mix of red, blue, yellow, white, black, etc. In the later days, white and black became quite common. I don't have the breakdown on colors. It's a rather difficult item to clarify. I have a listing of all cars from 1990 which I am using to try and find out things such as color variation. It takes time ... well it takes ME time. 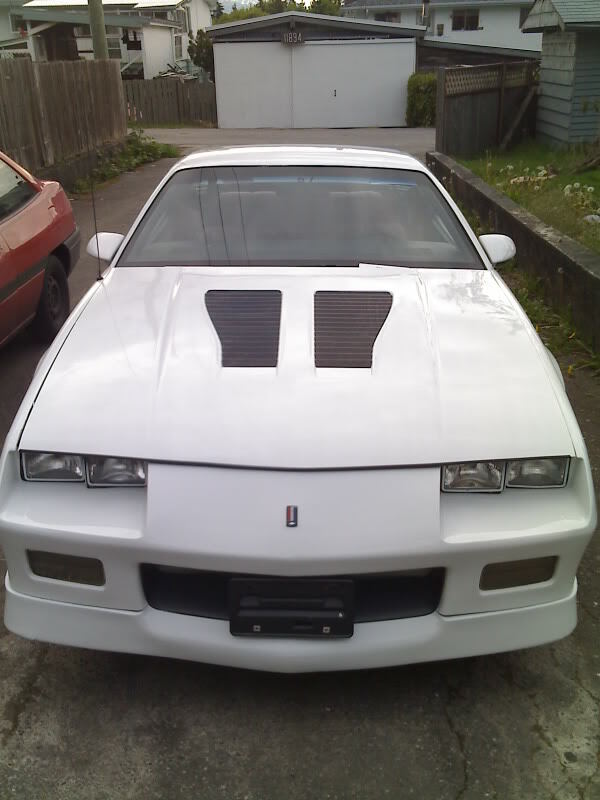 Right here I own a 91 Z28,1LE,R7U. as far as i can tell it was unraced but is in excpetional condition. Last edited by Chris88Camaro; 09-28-2006 at 12:52 AM. most consecutive wins etc for the whole series history. it has been in storage for 9 years. only 2 bangs on it very small never changed a panel , which was very rare. Did you get the car recently or have you had it for a while? How did you end up getting the car? Well I picked the car up at Bob johnston chev olds in 1992. Got it through Jim Duckworth who was part owner then and his son Paul Duckworth also ran in the series. allot of cars came from that dealership. Then I drove it to the championship. car did not come with a cage. It was put in at CSC racing products in north toronto along with the fire bottle, seat. Also another way to tell if they are real players cars with the engines are the yellow paint seals everyone has talked about. There was also wire seals I believe and iam very sure there was ultraviolit (sorry for the spelling) paint seals as well that you needed a blacklight to check. It is a pleasure to have an owner/driver on the boards. It's not often this happens. Welcome! Your 92 was one of the lowest production years for Player's cars, and it also probably still has it's original motor (which is nice for collectors). It's good to hear that there is still a few original cars around. Many were converted to full race, and others ended up on the street. I'm sure many people would be interested in hearing details about your car. How it was ordered, what prep work was done when you got it, the race chip, and so on. PS. your correct on the ultaviolet paint. I spoke to one of the chief tech inspectors and he still had his bottles of paint (to reseal the engines). Last edited by Mark_ZZ3; 11-07-2006 at 10:08 PM. Martin Chenhall, an executive at General Motors for many years who was largely responsible for the creation of the GM/Player's Challenge Series, died in December after suffering a head injury. He was 70. Everybody who knew him is invited to attend a "Celebration of Marty's Life" at the Whitby Yacht Club next Saturday, Jan 13, at 1p.m. I did a quick search, with little results besides the obituary in the Star. Looking for any additional info about him. Anyone else have any info about him? It is a very said announcement. Martin Chenhall was a key member in the Player's Challenge Series. I have many news letters and announcements from the series that were written by Martin Chenhall. They don't talk specifically about him. If you are interested, I could email a few ... just drop me your email over PM. Its me Jeff in Ontario - Long time no talk for sure. I think I need you to send me your home address again - I believe I still owe you $20.00. And you think I forgot eh ? A few years over due, but not forgotten. We should touch base, lots of things and not so much to share. The man with the rare 1986 L69 TA! Glad to see your still around ... and still have the car. I got some neat 1986 stuff (original GM race Registration info, bond stuff, etc.). I'll drop you a note. Mine is a A4U car. as documented by GM Canada Historic vehicle office in Oshawa. 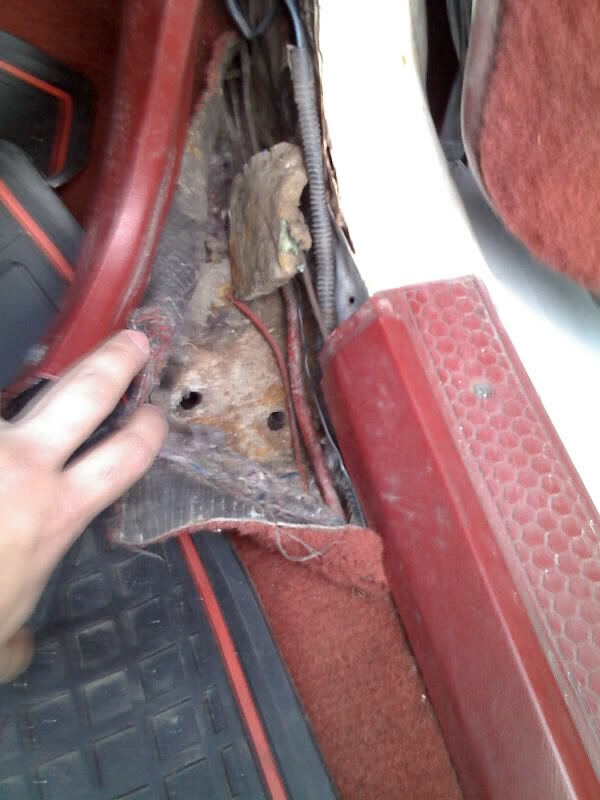 Does your car still have it's original equipment? Engine, Brakes, etc.? Any racing stuff like the cage, exhaust, etc? The engine is not original, I have a 400 Hp 350 in it. T-5, aluminum driveshaft, factory 1LE PBR brakes all around, Koni yellosw, AFCO springs, stock BIG sway bars, It still has the original dash and roll cage- it has been modified by saftey additions. approx 43K kms on it the car and it has been a racer from day one, lots of track miles!! It has been off the track for a few years probably 8+ out of the last 12 years. 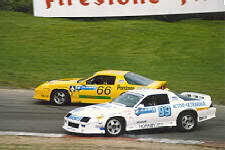 It was a players car and then an IMSA/Firestione Firehawk car. It also won it's class at Sebring one year! It has been an endurance racer most of it's life. It was one of 2 cars the Bert and Ernie's eatery in Toronto campaigned. I would like to find some photos of the original paint schemes. great car and fast, lots of fun, I would like to run some historics with it. 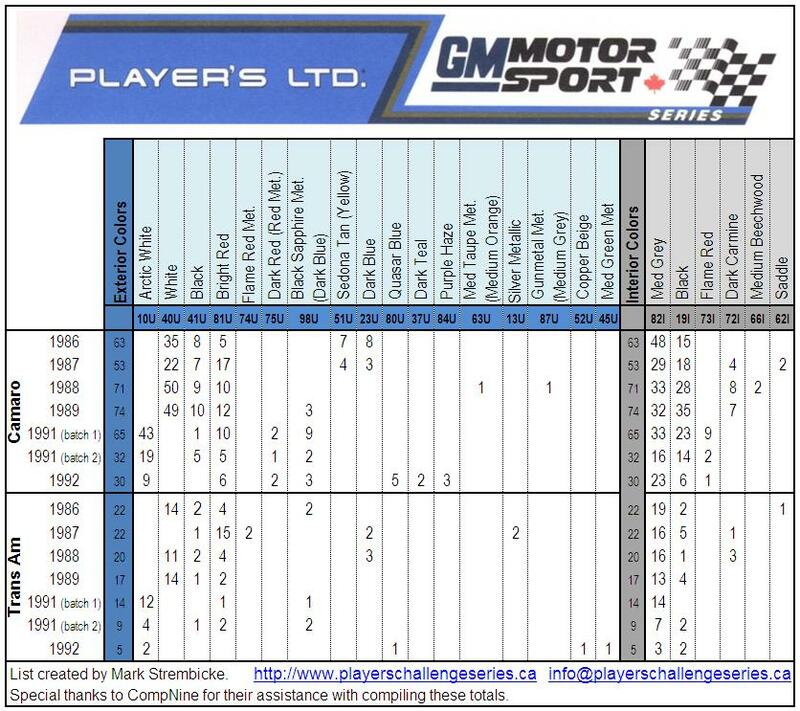 Check my web site out http://www.playerschallengeseries.ca under "drivers/teams". I have pictures of all the 1988 cars. Yours will be there ... just need to know who it was raced by, or which dealership/sponsor it had. I can help narrow it down. Drop me a pm if you would like assistance. This thread caught my eye because I've never heard of a players challange car.. I'm guessing it was only a Canadian thing eh? Find More Posts by 89RsPower! Yup, it was a showroom stock racing series run in Canada back in 86-92. IT was the brainchild of a few folks both in and outside of GM. The cars were all "stock" and could not be modified. Engines were dyno tested and sealed. Cars were identical. - 1986 cars were L69 HO cars. All but a few 1986 L69's were shipped to Canada. - Engines were assembled from the same castings, fuel injectors flow matched, engine's dyno'd and sealed. - In 89-up, both camaros and TA's got the 36MM front sway bar and "wonder bar". - 1989 cars (R7U), while they had 1LE, had different front struts than the 1LE kit. Both the stock 1LE part and the as delivered struts were acceptable to race with. Some will say that the 1LE package got it's roots up in the Player's series. The twin piston caliper brakes most certainly can be traced back to player's racing. They were the only calipers that were DOT approved (from the vette) and allowed for larger rotors. In 86-87 Bremdo calipers were used, but they did not meet DOT. ... I can ramble. Some day it will be in a book! My name is Kevin Cinnamon (Son of Tom Cinnamon). 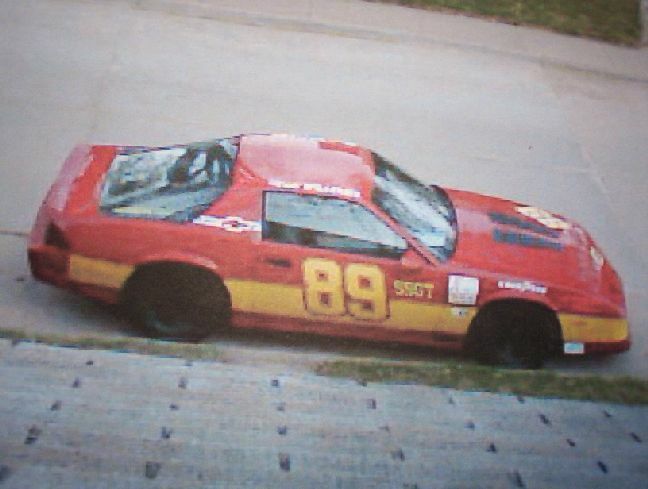 My Dad raced at Mosport in 1988 with my Cousin Randy MacDonald in the Hostess Chips Camaro. My Dad later on became a chief scrutineer for the Export 'A' Formula 2000 series before it folded. He then moved on to the Canadian Formula 1600 series where he continued to be a chief scrutineer but he became the series chief steward a couple years before it folded. I would like to say that you have done a FANTASTIC job recreating a website based around one of the exciting racing series from the past. I am in total AW over what you have done, collected, & shared with us! Last edited by Kevin Cinnamon; 02-20-2007 at 12:47 AM. My name is Kevin Cinnamon (Son of Tom Cinnamon). My Dad raced at Mosport in 1988 with my Cousin Randy MacDonald in the Hostess Chips Camaro. My Dad later on became a chief scrutineer for the Canadian Tire Formula 2000 series before it folded. He then moved on to the Canadian Formula 1600 series where he continued to be a chief scrutineer but he became the series chief steward a couple years before it folded. I would like to say that you have done a FANTASTIC job recreating a website based around one of the exciting racing series from the past. I am in total AW over what you have done, collected, & shared with us! You are not alone in your regards for Mark and his position of respect and diplomacy. I believe that car you show is at LMC in Milton these days or so I am told. i have ron fellows 1988 or 89 1le back up car. its sitting in my back yard. iroc. 60 something original kilometers but partly parted out. might be interested in selling it. would need alot to get it back in shape. If you have supporting documentation, your car would have more value than a typical Player's car. A 1989 also a higher value car compared to an 88. 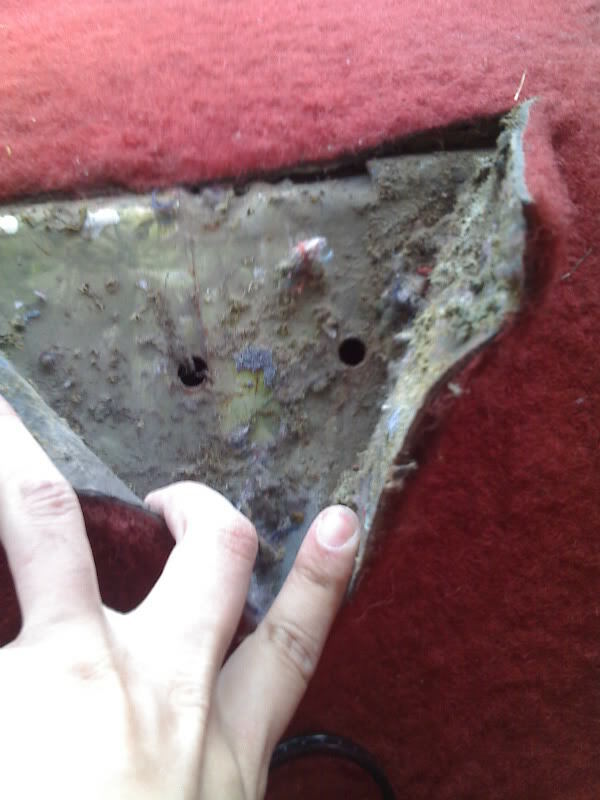 If you need help in documenting the car, drop me a note. hey ya guys, im new to posting but I've been browsing the forums for a while now, I think I may have run into something special, anyways I finally bought my 1989 Iroc 2 weeks ago, but i was surprised when i took a look at the RPO codes last weekend , the vin seems fine and the RPO numbers match, there is also yellow paint on the bolts, and I can also upload the pics of where the roll cage might have been bolted. You have the 1LE and R7U according to the RPO codes, you can verify by looking at the brakes, 2 piston aluminnum in front with (almost) 12" rotors, the stcok ones are only 10.5 inches. example Mine is a 1988 and is a A4U car. GM can verify for you if this is a real Players car or not.BUt it appears it might be. Great find! Where did you buy it? Nice car! I also have a white R7U although mine is a 91 and was never raced as far as I can tell. I'd like to see pics of the rollbar mounting points. Where are you located and where did you get the car from? Did the seller know it was a 1LE/R7U? Im located in burnaby, BC, I bought the car out in maple ridge from some guy who said that he was more interested in buying a house than having a car, I dont think he knew that the car was a possible ex-players series car, also the brakes rotors and spare wheel match. 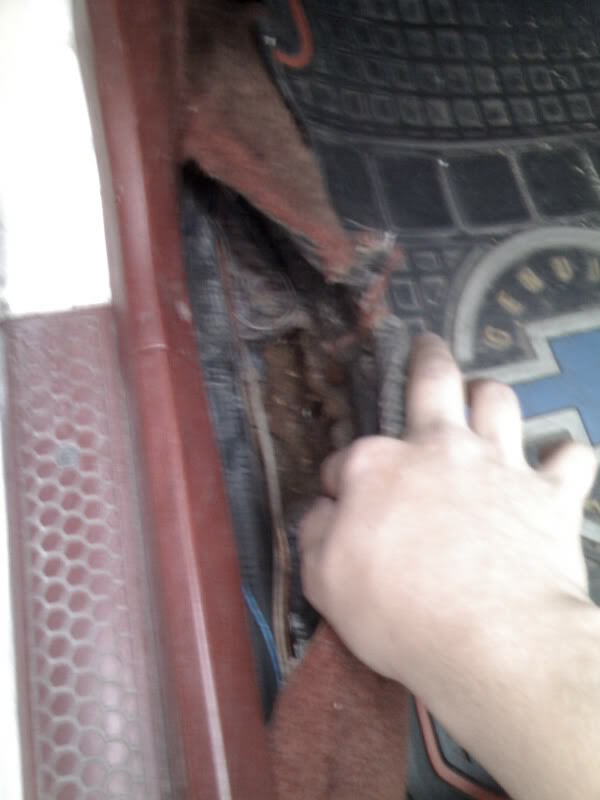 Rust on the floor is a common problem once the holes are drilled. Sort of the down side to owning the car. But hey ... it was a race car ... most every panel has body work in it. The N10 (in 89) was not part of the R7U package. 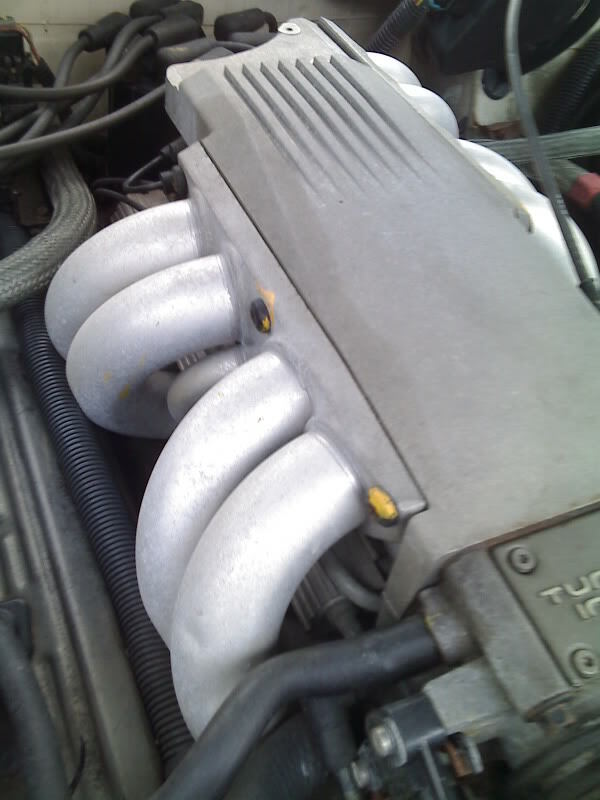 In order to run the racing exhaust, it was based on the single cat system. The later years did come with the N10, but the teams had to remove it and put in the single cat system. If you can locate the original dealer, you can probably determine who drove it. Gm Vintage can help you with the dealer info. I can help with finding out who may have driven it. My personal opinion is that the 1989's will be one of the higher value cars in the future. Except for an original 1986 "as-delivered" race car (GM supplied the cars with the cage, exhaust, and racing engine). At the "Champ Car Race" in Edmonton this summer, there is a Vintage Class? And did you know, a Player's car is eligible??? Driving your 89 car in a Vintage race ... who would have thought?